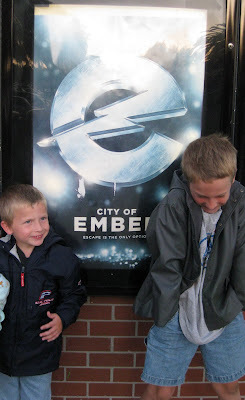 Yesterday was opening day for City of Ember, the movie that our family has been longing to see. We were all surprised (but then again, not really) that the movie added some elements that were not found in the book. Like rhino-sized beetles and a deadly mole the size of a blue whale. Nathan, brilliant boy that he is, commented that the story is good enough without the additions, but that the scene where the mole snacks on one of the characters was his favorite. There were other elements left out, which would have added so much to the story, particularly the urgency that the characters feel in the book to find a way out of Ember. In the movie, it felt more like a fun pastime than a life or death situation. The other thing I found distracting was the casting of twenty-four year old Harry Treadaway as Doon, who is a boy of twelve in the book. I think what captured our imagination with the book was that these two children, Lina and Doon, come to the realization that it is up to them to change the situation they are in, no one is going to come rescue them. Since we work hard to teach our boys that no situation is unchangeable and that we do have control over our lives (particularly our attitude towards the things we don't have control over), we felt this book was totally in line with our values. Having a man in the boy's role played down the idea that kids can make a difference. But then again, we are viewing the movie after having read the book several times. The art direction was wonderful and Bill Murray was suitably creepy as the Mayor, but I don't think the film will last long in theaters. 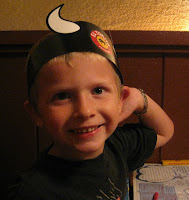 Following the film, we had a happy celebration at El Torito, where Ernie our favorite waiter was back from eight weeks of recuperating from a broken ankle. We were thrilled to see him, and he was slightly embarrassed from our enthusiasm over his return, but with service at most places going directly down the toilet we want to give credit when someone goes over the top with greatness!